I visited Marton Primary twice during the final half term of the year. My first visit was part of a forest-themed event involving children from local nurseries. I shared a story about a little spider who uses his brain to overcome some of the most fearsome creatures in the forest. It’s a good story and involves lots of animal noises and impressions, which the children seemed to enjoy. Over the course of the morning, I shared the story with six different groups and the rain held off – a top result all round! Thanks go to the Foundation staff who invited me along. I had a great time! My second visit was to meet the KS2 pupils and Year 2 to share my books. 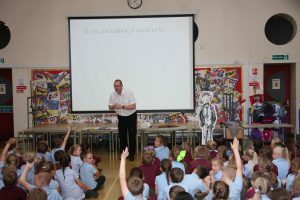 It had been a couple of years since my last author assembly at Marton so I had a lot to tell the children. They listened brilliantly as I talked them through Eric’s adventure and More Impossible Tales. I showed them the illustrations created by Martin before putting on the storytelling waistcoat to perform one of my favourite Tales. The pupils laughed at the right moments and their reactions were perfect! The assembly was the last of the year and was followed by a book signing. It was great to chat a little more to the pupils and answer lots of questions. I’d like to thank Mrs Coyle for organising and promoting the assembly and signing.